I'm missing a very important test. How well do S5 roms run on the S5 active. Great. 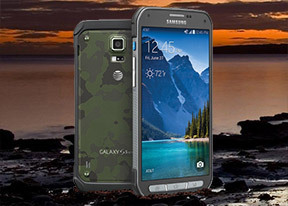 The only rugged high-end phone in the world. For active (and careless) people ! "Plugging in a pair of headphones causes a rather large spike in stereo crosstalk" = no buy for me! By far the only phone compatible with Gear Fit which I would want! Wonderful review but could be much better if games like Dead Trigger etc are also included in order to test the GPU performance. How is it possible that they can get this through the design division without some alarm bells ringing? How many focus groups agreed that this aesthetic design was pleasing?